Sunday morning and I’m on the streets. The sun is shining and it’s busy. I have 3 volunteers with me from 3 different churches and I’m armed with a pile of free hug signs and some money, £50 to be precise which has been donated by an amazing supporter of The Light Project. The hope I have for the morning is to show something of God’s grace. It turns out that they haven’t had such a request before and that the area manager needs to be consulted. I pop in ten minutes later and they phone and confirm that my wacky request would be OK. The four of us stand in the street and give out some free hugs, there is lots of intrigue as to why we are offering them and some amazing conversations too. While we are merrily hugging people on Sunday morning, people also encounter a grace gift as they stand at the till ready to pay for their food at the bakery just behind us. Some people (but not a lot) come out to express their thanks. Others decline the offer and ask that the gift is used for people who need it more than they do. The ladies working in Greggs do a great job as evangelists. “would you like the Church to pay this for you?” I hear the assistant manager ask people as one after the other people come to pay. After a couple of hours I take a break from hugging and call in at the local tattoo shop to catch up with the staff and they ask what I’ve been up to. The owner, a loving young man is touched by the simplicity of showing love to people that he thrusts £20 into my hand to refresh the money supply behind the counter of Greggs. After giving more dosh to the staff to use to offer people a free gift I direct some guys off the streets who are homeless to choose their lunch. 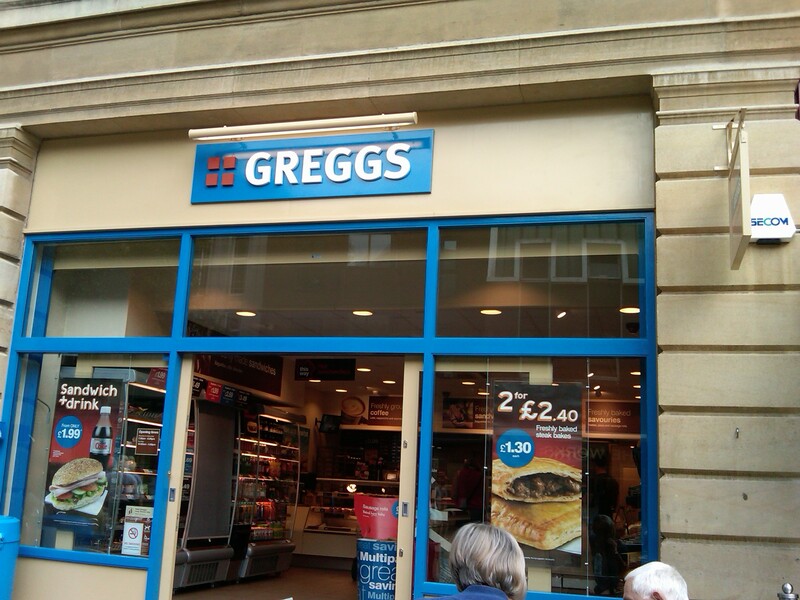 They express their gratitude as they leave Greggs with a hearty lunch each… Courtesy of a man who owns a tattoo shop and served by Greggs staff who explain that their lunch is a gift from the church. “I thought there’s no such thing as a free lunch!” A couple said as I spoke with them about what we were doing. When it comes to the outrageously generous free gift of God’s Son, there really is a free gift that is undeserved and my prayer was that somehow people would connect with the message of grace through the means of hugs and the generosity of someone elce picking up the tab. What do you think? Is this something you could do in your town or city? Getting others to be channels of God’s grace – BRILLIANT! After all, it can be difficult explaining in words, so why not let them do it!